DELAWARE, Ohio – The annual meeting of the Delaware County Historical Society was held on November 13 at the Barn at Stratford. The business portion of the agenda was handled during the first half of the meeting and included remarks from President Jack Hilborn and Executive Director Donna Meyer and the financial report presented by Treasurer Ralph Au. 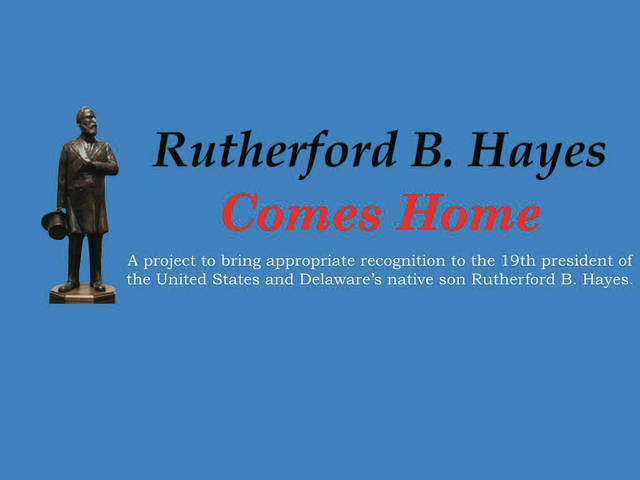 President Emeritus Brent Carson also spoke briefly about the “Hayes Comes Home” project, a community-wide effort to erect a statue in downtown Delaware in honor of native son and 19th President of the United States, Rutherford B. Hayes. The election of six Board trustees to 3 year terms commencing January 2019 was conducted, with all Society members in good standing and present at the meeting eligible to vote. Brent Carson, Lynn Foreman, Susan Garrett and Roger Koch, all currently serving trustees, were reelected. David Hejmanowski, Judge of the Probate/Juvenile Division of the Delaware County Court of Common Pleas, and James Mendenhall, Development Officer at the Columbus Zoo and Aquarium, were both elected to their first terms. Outgoing Board members Ana Babiasz and Benny Shoults were thanked for their service.